How to create a woocommerce discount based on the email domain? How to create a woocommerce discount based on the customer email domain? Email addresses from a company are grouped under the same email domain and can be easily used to target a group of customers for multiple purposes. If you wish for example to apply a discount on all customers from a group or company, one of the best way to do it is to target their company email address domain. In today’s article, you will learn how to create a discount on an order subtotal or a product price based on the customers email domain using WooCommerce All Discounts. An email address is usually structured as pseudo@domain.com where domain.com is the domain name. It can be gmail, yahoo, hotmail or your company’s. Anybody that work in a company will have a professional email based on that company domain name. Click on Discounts > New discount to access the discount creation page. Then scroll down to the rules section and click on the Add rules group button to create a new set of rules. 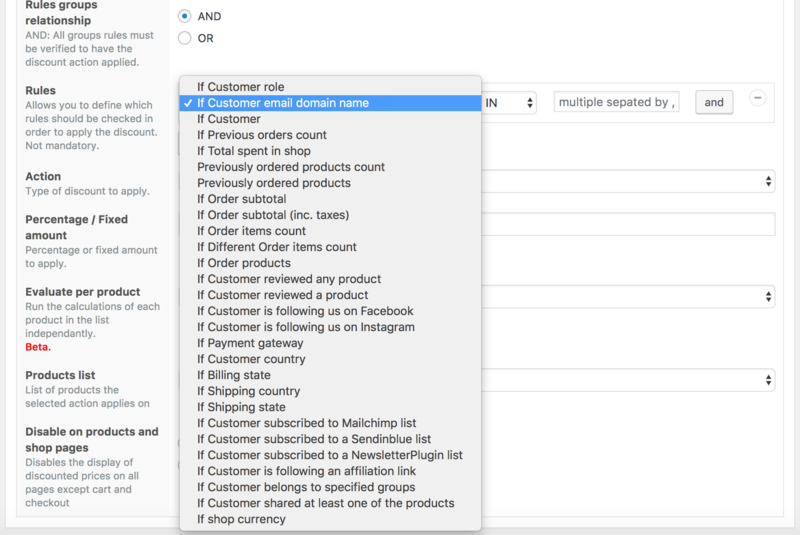 In the rules dropdown that will show up, select “If customer email domain” as discount condition. Then enter the domain name in the value field. If you want to apply the discount on multiple domains, you can add all of them, separated them by a comma. Select Percentage off product price or Percentage off order subtotal or any other action according to your needs. Select the other discount parameters and then save your discount. The plugin will then check the customer’s email domain against the email of the logged-in customer and apply the discount if it matches any of the domains set in the discount rules. This completes our woocommorce bulk discount demo tutorial on the creation of discounts based on the customers email domain using WooCommerce All Discounts. If you have any questions, use the comments section to ask. Is this available only in the pro version? No mention of it in the comparison of free vs. pro. Just want to confirm before purchase.